Yeah. I did it. After spending about 2 hours in the internet cafe… while chatting with my baby… I’ve uploaded the first bunch of pictures to Flickr. Watch and enjoy! Wat een mooie plaatjes. Onze trip naar Canada komt hiermee weer helemaal terug. We zijn benieuwd naar ‘t vervolg. Prachtig weer trouwens ook daar in het verre westen. Veel succes bij je volgende stap. Skar its so great to read your experiences, but i love the pics they say so much more. Try to see much as you can, but remember its just a hollyday 😉 ha ha ha..
Peter says HI and misses you. @mom: Yeah… everything looks so stunning. I love it. 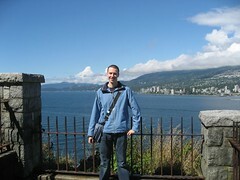 Vancouver is awesome and really a place I can recomment to visit some day!